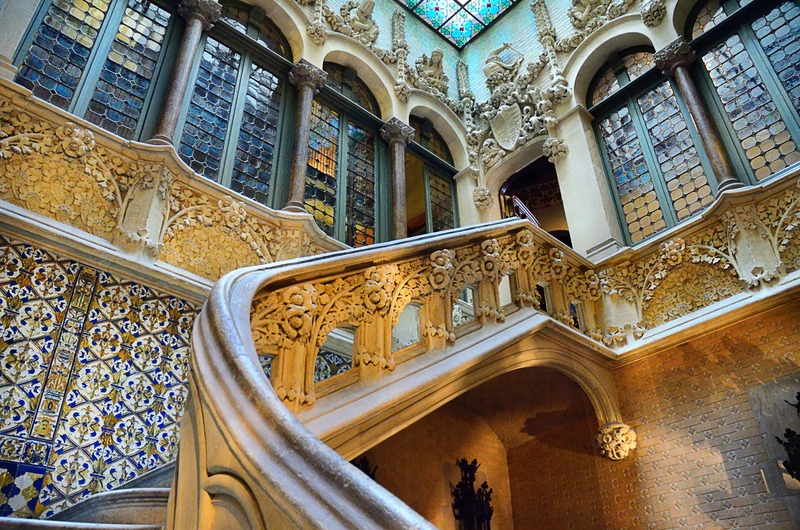 Built between 1904 and 1906, Palau Baro de Quadras, is a beautiful sample of Catalan modernisme. This palace was designed by architect Josep Puig i Cadafalch for Baro de Quadras (baron of Quadras). The building's main entrance is at Avinguda Diagonal 373, where you can appreciate a very elaborate façade of European Gothic influence blended with Neo-Plateresque style. From across the street you seem to be standing before a Renaissance Italian palazzo rich in lattice work. Worth mentioning are the gargoyles and floral adornments on this side of the palace. On carrer Roselló there is a backdoor entrance. That side, features a Modernista style with some hints of the Wiener Sezession school (Vienna Art Nouveau or Jugendstil). This emblematic place was known till last October as Casa Asia, which is a public cultural institution devoted to the promotion of projects to strengthen relationships with that continent and that is going to inaugurate its new premises inside Hospital de Sant Pau's modernist complex. For those who don't know, the old Art Nouveau buildings there have been restored and will be used for other services. Palau Baro de Quadras has been donated by the City Town Hall to Ramon Llull Institute. As part of their mutual collaboration, the City Council will integrate in the institute's consortium with the intention of participating in the international promotion of Barcelona and Catalonia. Institut Ramon Llull is a public body created to foster Catalan language studies at international universities and to promote Catalan cultural production in all artistic areas. But let's return to our palace. Notice in the image above, the stairway to the upper floor. Upon entering through either the main gate or the backdoor, you arrive to this place which has a small fountain to the right over a beautiful mosaic floor. Besides the profuse adornments surrounding the stairs, you really ought to see the stained glass ceiling that is slightly shown in the upper part of the photo. Some other day I will show you the gallery in the second floor and other details of this wonderful building so well preserved. I hope you enjoyed yet another Barcelona photo here at Barcelona Photoblog. Perhaps you want to check this previous post about Palau Baro de Quadras. But to know a place you need to see it for yourself and not just an image. Take a look at this very short video with slides that show the whole palace. Stunning! I'd love to experience it in person. A stunning interior. Palau Baro de Quadras goes on my sight seeing list for the next time I'm in Barcelona.